This is a recap of my second day touring Ridgefield National Wildlife Refuge; if you haven’t already checked it out, be sure to read about day one here. Sunday’s selection for me was a guided walking tour of the Kiwa Trail, normally closed in October but open for the day due to BirdFest, and a drive along the full “River S” unit of the refuge. Our guide from the Audubon Society was a gentleman who – along with his wife – set the Washington State birding record at 370 species in a single calendar year. This is no small feat, and I was excited that I may pick up a birding trick or two. To reach the Kiwa Trailhead, you have to drive part of the “River S” unit into the refuge. From October 1st to April 30th, the Kiwa Trail is closed and the “River S” section of the refuge can be visited from within a vehicle only; there are two spots at which you are permitted to exit the vehicle, a designated bird blind and a restroom area right at the entrance. Giddy with excitement (I am a bird nird, remember? ), I drove down a steep ravine and across the single-car wooden bridge into the refuge. I made sure to arrive early, in case I saw anything worth stopping for on the drive in. It was a good thing, too! This handsome red-winged blackbird was in the cat tails just beside the road, flashing his red and yellow plumage at another nearby male. 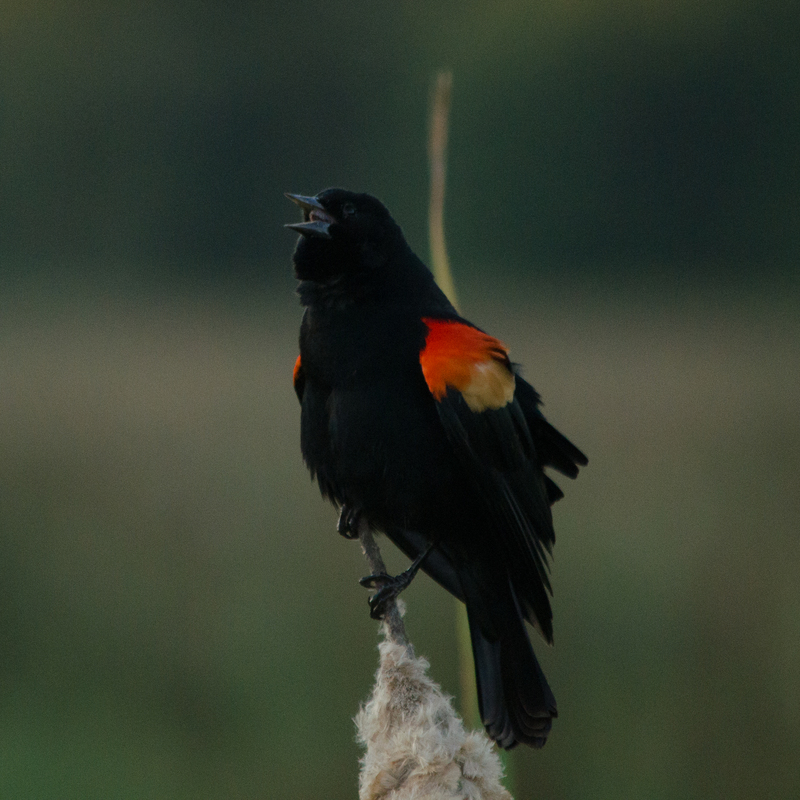 Red-winged blackbirds have a variety of songs, lovely to listen to. I sat for several minutes watching and listening. The less-spectacular females were about as well, but apparently not feeling up to an early morning photo-op. At the trailhead, I gathered with the other birders waiting for our guide’s arrival. 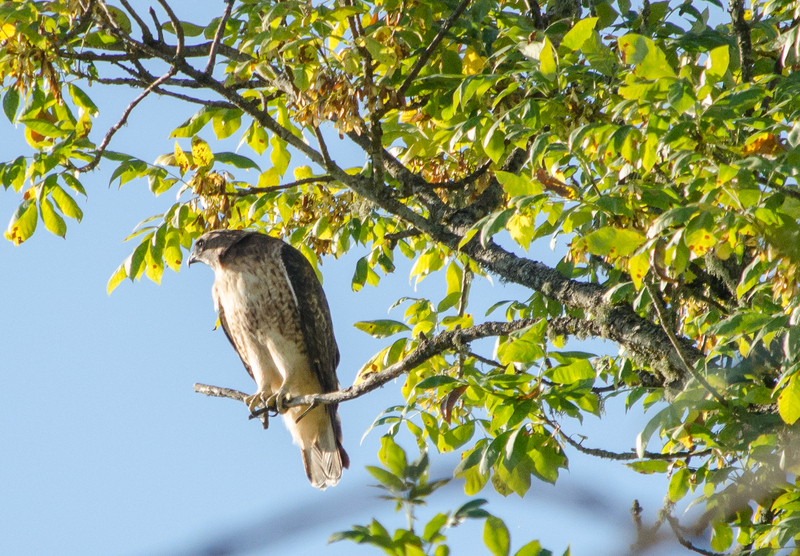 As we chatted, we also watched a male northern harrier hunting in a nearby field and spotted a young redtail hawk hanging out in a nearby tree. As we wound our way into the riparian forest and wetlands area along the Kiwa Trail, we encountered song sparrows, golden crowned sparrows, possibly a purple finch (he did not stay around long enough to be certain), house finches, chickadees, American Kestrels, distant bald eagles, and western scrub jays. The highlights of the walk, however, were lurking in the shadows of the forest. 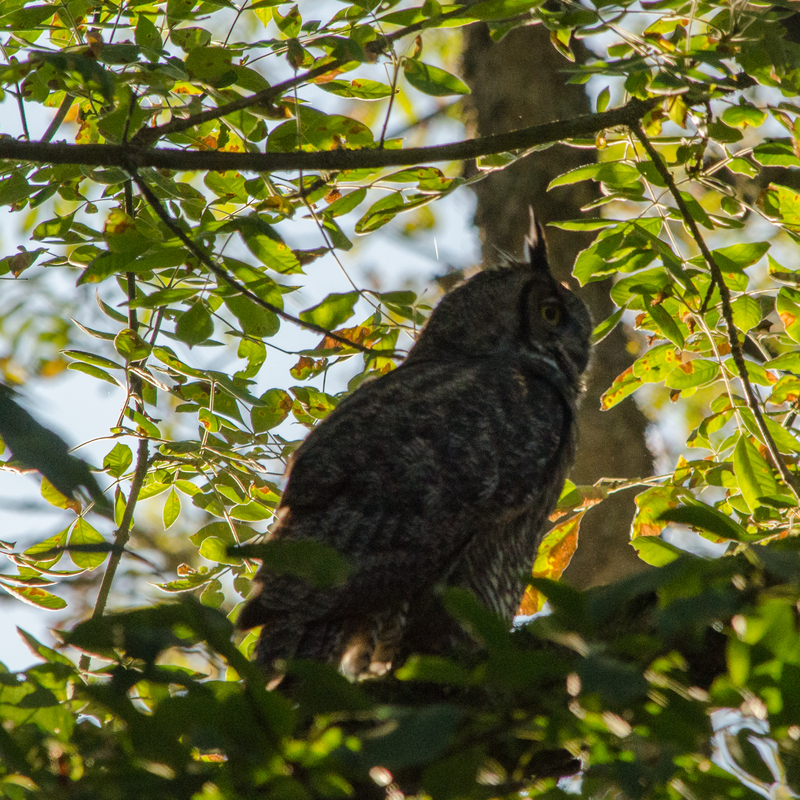 Luck was with us, and we saw not one but two great horned owls among the branches in the early morning light. They seemed a bit grumpy with the hubbub our group made, barely looking our direction and not sticking around very long at all (for which I cannot blame them). This was bird #99 towards my goal of 100 photo-documented species in 2014, a great personal achievement! With the guided tour complete, I waited a bit for several of the others who had been on the walk to depart in their vehicles, hoping that by lagging behind I would catch birds along the auto route for additional photo opportunities. This may or may not have worked, but I certainly did have some additional encounters I was happy about. Young water fowl were in the waterways along the road; pied-billed grebes and wood ducks predominately were close by, with migrating flocks of mallards and pintail ducks in the distance along with great blue herons, great egrets, sandhill cranes, Canada geese, cackling geese, and dusky geese. 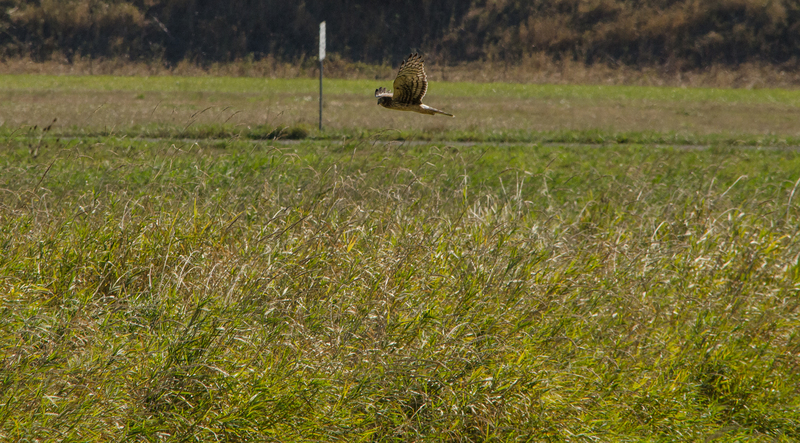 Swooping over the fields was a female northern harrier searching the tall grasses for prey. 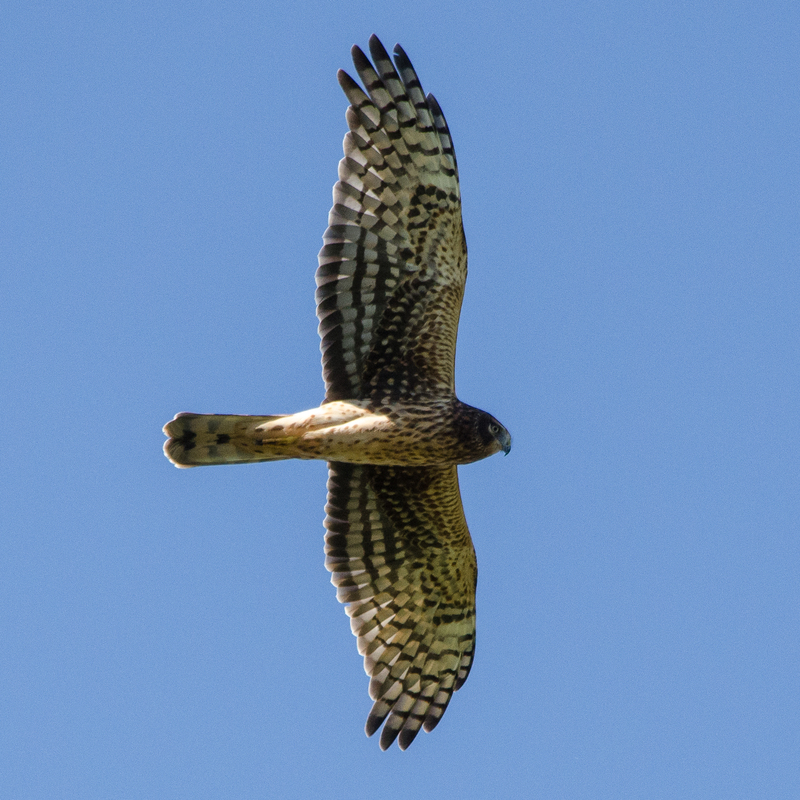 The northern harrier is distinguishable from other hawks in great part due to the owl-like flatness of their facial features. The females are reddish-brown in color, while the males are silvery gray. Both have bright, light colored eyes. As I neared the end of the auto route, I took my time observing the huge flocks of geese and ducks gathered together in hopes of spotting something unusual. The bright-white plumage of a lone snow goose among the sea of browns was easily picked out. The tips of the wings on a snow goose are black, hard to see in this crowd; the bill and feet are an orangish-pink, and up close they may appear to have black “lips”. 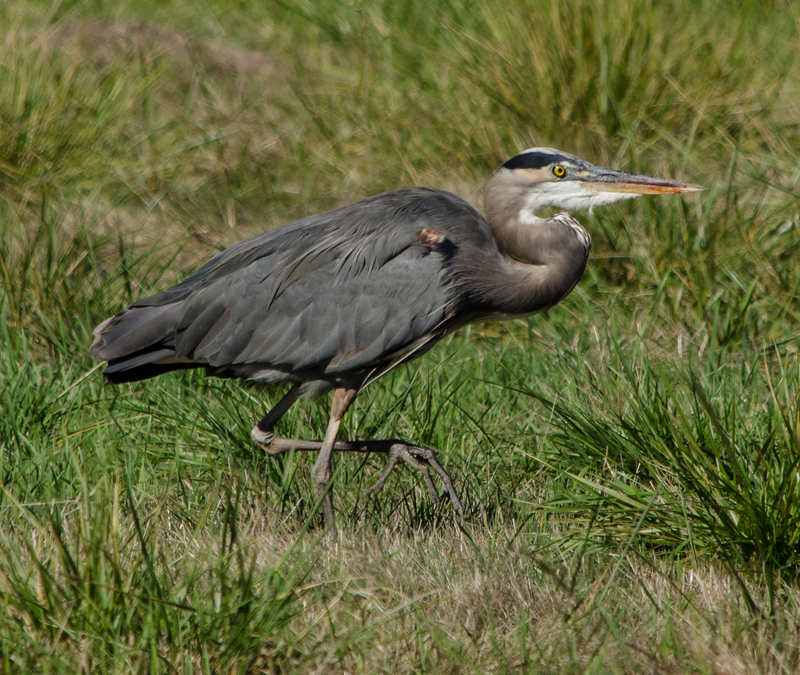 Approaching the exit, a young great blue heron was standing among the grass and I stopped one last time for a close-up of this bird stalking a meal. Spooked by a passing vehicle, he came up empty before taking flight to a more remote location to try again. Although it is a bit of a drive for me to reach the refuge, this is definitely a location I will be keeping in my list of birding spots to revisit throughout the year. The variety of habitats and resulting array of birds and other wildlife should make any journey worthwhile. I must say that the idea of winter birding from the warmth of the car has a certain appeal, too!